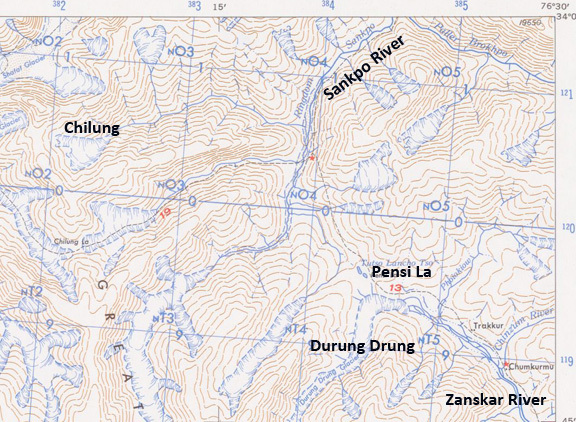 East of the Chilung La and 20 km northwest of Durung Drung Glacier draining into the Sankpo (Suru) River is an unnamed glacier, here referred to as Chilung Glacier. The Suru River flows northwest from Pensi La, while the Zanskar River flows southeast from the Pensi La. The Suru River has a 44 MW hydropower project at Chutak. 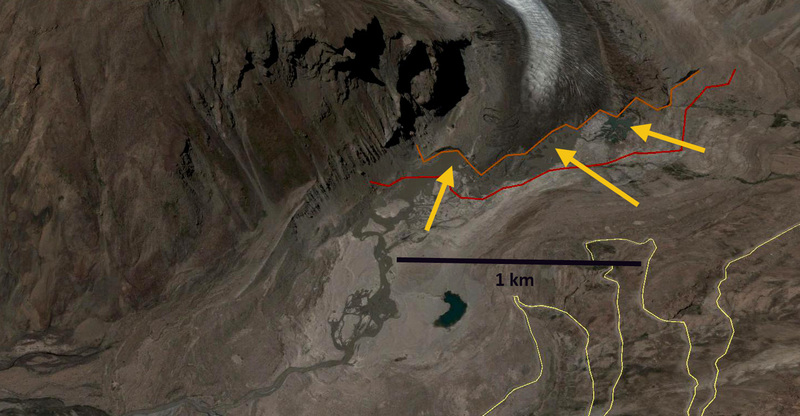 The glacier is 6 km long starting at 5400 m and terminating at 4400 m.
An examination of Landsat imagery from 1998-2013 indicate the expansion of a proglacial lake at the terminus and glacier retreat. The 1998 terminus is marked by a pink arrow in each image. 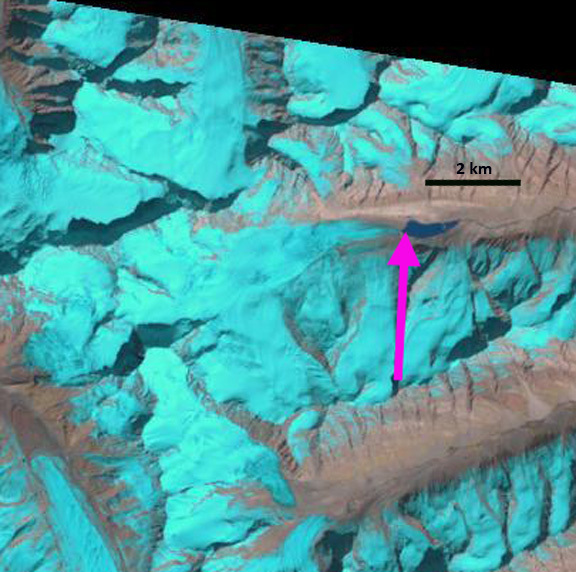 The yellow and green arrow indicate adjacent small glaciers. In 1998 the proglacial lake is 1100 m long and in 2000 it is 1200 m long. 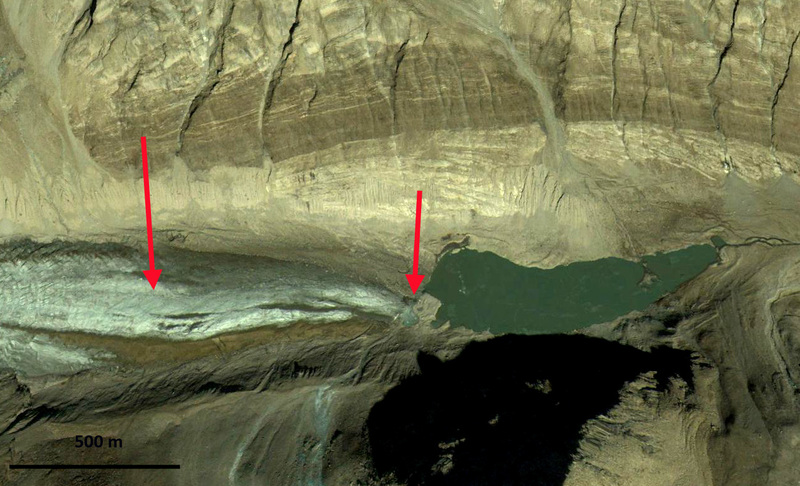 By 2005 the glacier has retreated 200 m and the lake is 1400 m long. 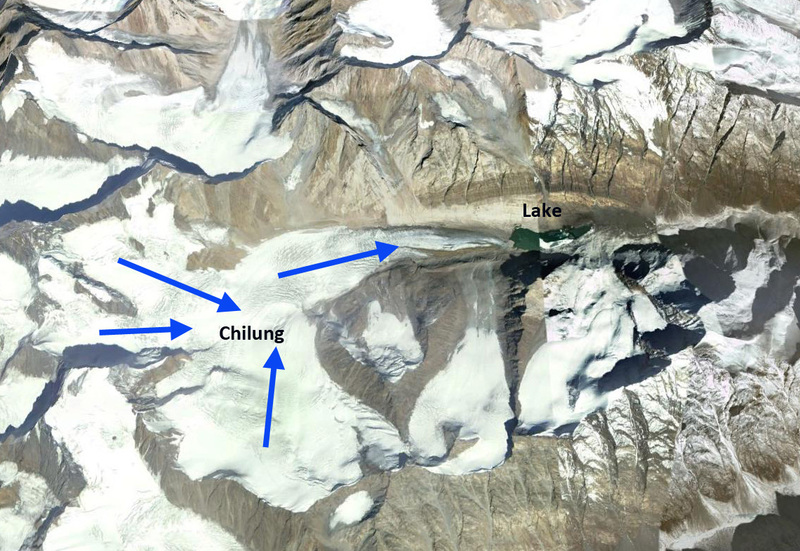 In 2013 the lake is 1650 m long, and the glacier has retreated 400-450 m since 1998. The retreat rate of 30 m/year is slightly faster than on Durung Drung. 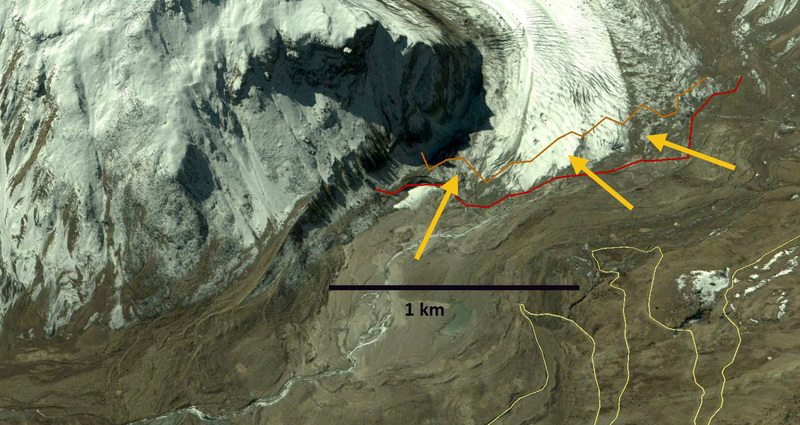 A comparison of the adjacent small glaciers on the slopes above Chilung Glacier, yellow and green arrows, from 2000 to 2013 indicate a loss in area of these glaciers as well. 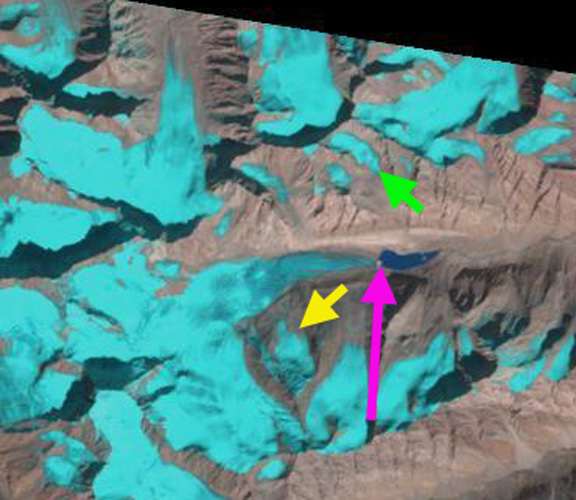 Google Earth imagery in 2000 indicates that lower 900 m of the glacier is uncrevassed and relatively stagnant, by 2013 half of this area has been lost. The lake is shallow and may not expand much further as the glacier retreats. 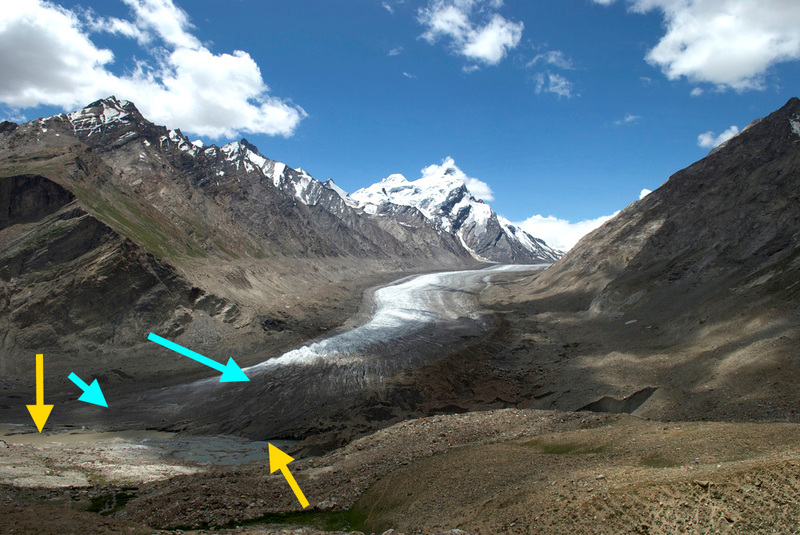 The consistent nature of the retreat in this area was noted by Kulkarni (2014)indicating retreat of 12 of the 13 observed glaciers in the region during recent decades. 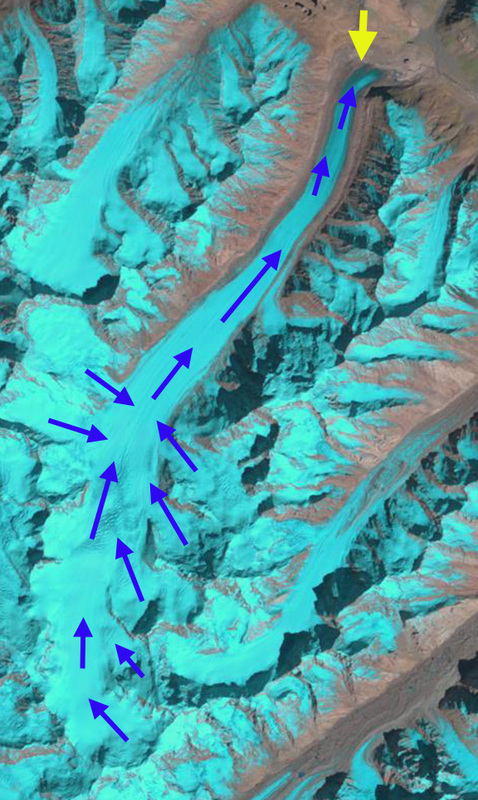 Glacier thinning has exceeded the rate of retreat on many glaciers in this area, indicating that retreat is likely to increase. The Durung Drung Glacier (Drang Drung) is a frequently seen glacier from the unpaved Kargil-Leh road in the Zanskar, Lakdakh region of India that flows north from the slopes of Doda Peak. This road climbs up the Suru River valley from Kargil, crosses Pensi La Pass crosses the front of the Durung Drung Glacier and descends the Zanskar River valley to Nimoo. The Zanskar River joins the Indus River just above the village of Nimoo. 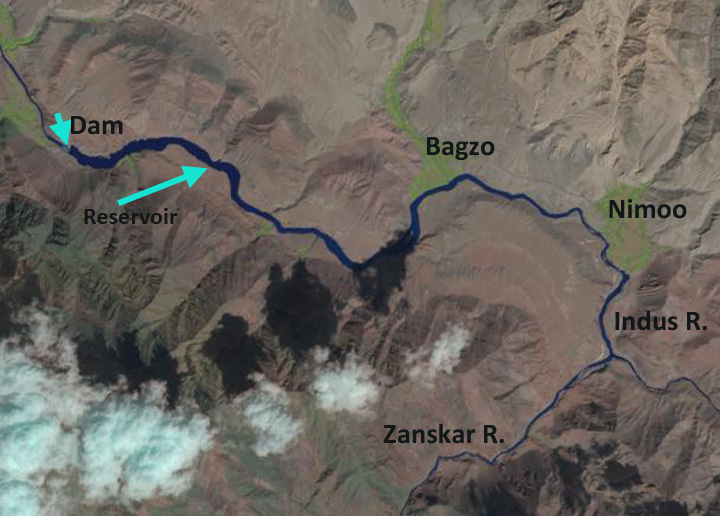 The Nimoo Bazgo Hydroelectric Project opened in 2012 and provides 45 MW of power to the Ladakh Region. Chris Rubey has a nice image of this power plant. This is a run of river project, that does not alter the downstream flow, but it does have a reservoir that stores 120,000,000 gallons of water, as seen in a 2013 Landsat image. There have a few inaccurate reports of late that this glacier is not currently retreating. Here we examine Landsat and Google Earth imagery from 1998 to 2013 to identify the magnitude of the recent retreat. 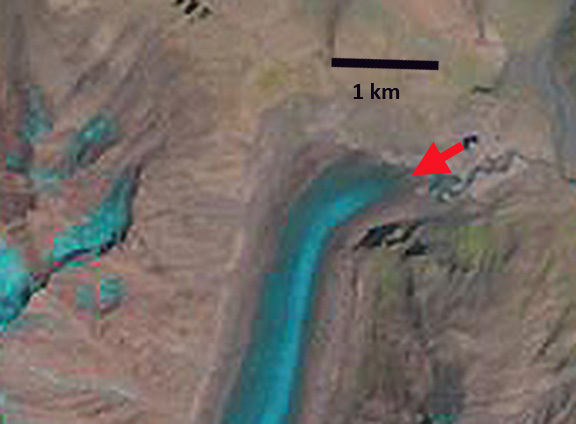 In Landsat images in 1998 there were no evident proglacial lake at the terminus of the glacier, red arrow. 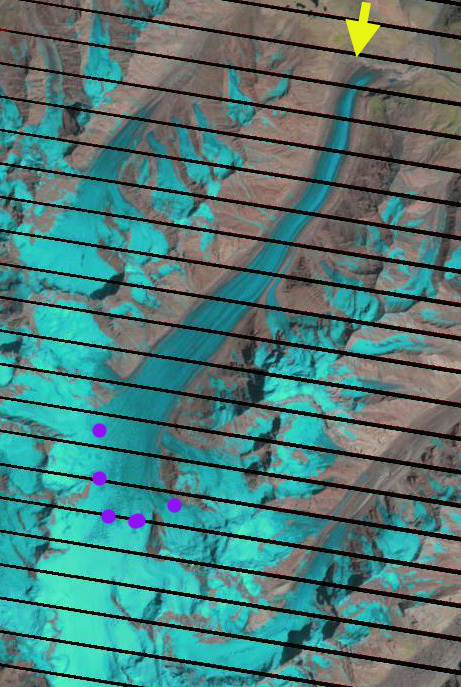 By 2013 a series of proglacial lakes are evident in Landsat images at the terminus red arrow. Looking at the higher resolution Google Earth imagery from 2004 and 2013. The retreat and development of the lakes is apparent. 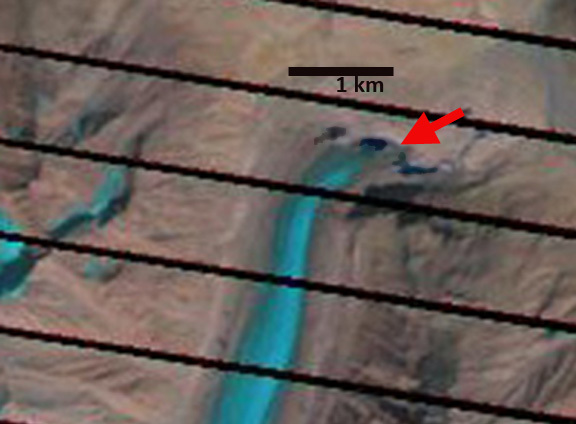 In each image the red line is the 2004 terminus and the brown line the 2013 image, orange arrows indicate three lakes that have formed by 2013. The retreat is 200-250 m not large for a glacier of this size but significant for such a short period of time. 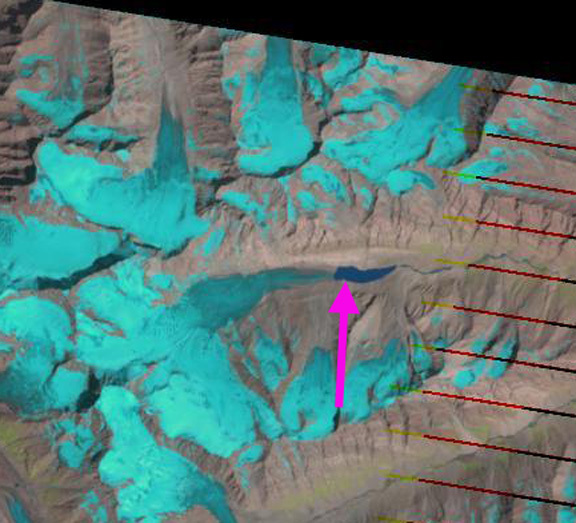 More importantly the smooth low slope terminus with pieces breaking off into the proglacial lake in 2013 is indicative of a glacier that is thinning and retreating, note video. 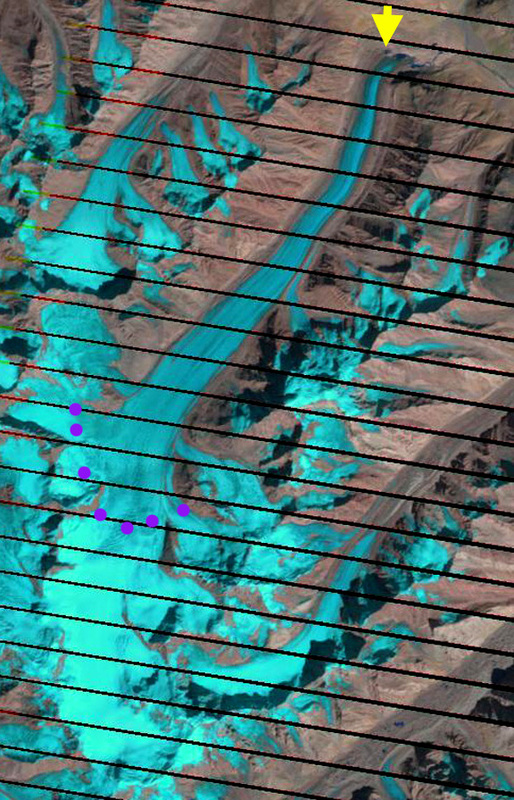 The lowest 1.2 km of the glacier is uncrevassed and has a low slope suggesting this area will continue to melt away. 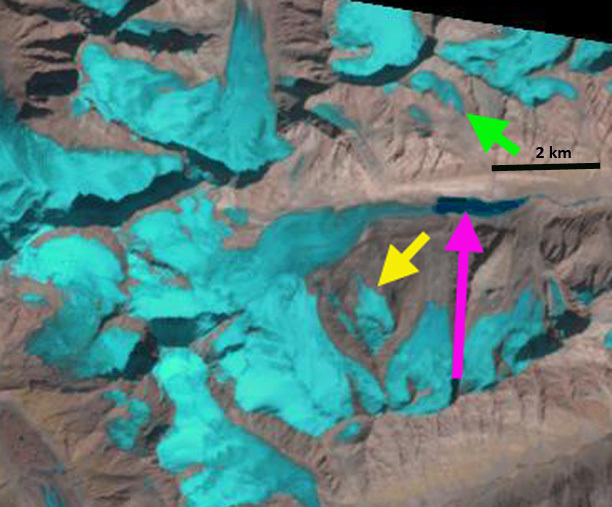 An image from a Zanskar River expedition indicates the lakes and icebergs in the lakes as well with the blue arrows indicating the low-sloped uncrevassed region.